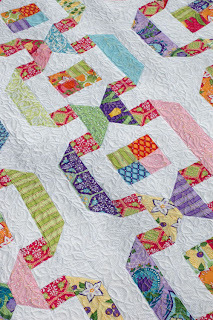 Fat Quarter Shop's Jolly Jabber: Amanda Murphy Patterns + Giveaway! Amanda Murphy Patterns + Giveaway! Hi everyone! I'm so excited to be featured on the Fat Quarter Shop Blog - this time to talk about my pattern line, which are now available. All six patterns feature Veranda, my third collection for Robert Kaufman, which will arrive in stores in August. Kimberly has the entire collection available to reserve right here at Fat Quarter Shop! I really believe that one of the things that makes quilting more enjoyable is a set of well-written instructions with lots of clear diagrams. 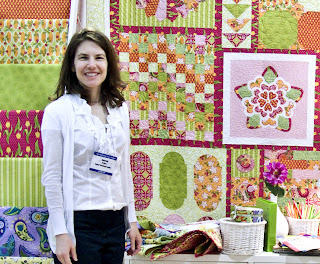 After all, we as quilters are very visual people. Clear instructions also can give us that extra boost of confidence to try a new technique - something we haven't done before. That was my aim in designing these patterns. 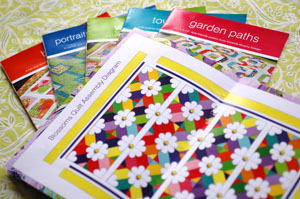 All are printed in full-color and feature a full-page Quilt Assembly Diagram on the center spread, with step-by-step instructions throughout. 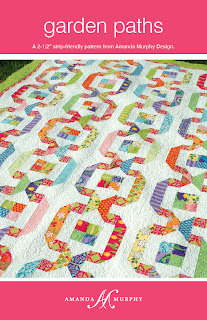 Garden Paths is the first pattern that I conceived for this line. 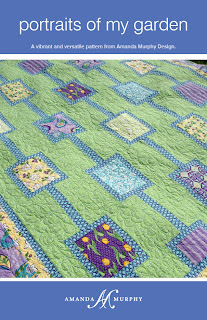 It is reminiscent of woven ribbons cascading down the quilt. 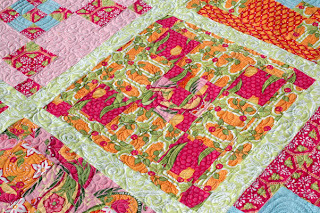 It looks complex, but the pressing directions result in diagonal seams that lock, which makes it a much simpler quilt to sew. Best of all it, it is roll-up/jelly roll friendly. All you need is 1 roll-up, plus border and backing fabric. 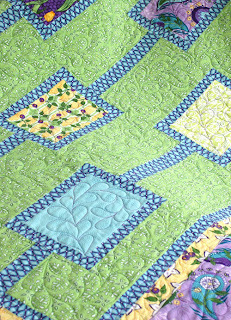 My quilter, Deborah Norris of Deborah's Quilting, did an extraordinary job quilting the sample, with rosebud and leaf vines cascading up and down the white background. 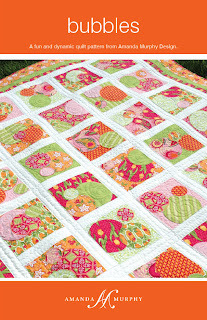 At 84" x 102", Village Green is the largest quilt in the line and is perfect for a bed. It uses up 2 roll-ups/jell-rolls completely. 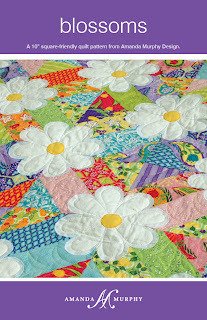 The directions call for flowers, constructed out of coordinating solids, to be appliquéd to the center of each block; you could vary flower colors or even fussy cut motifs from your favorite feature fabric and appliqué them on instead... That would be particularly fun for a child's quilt. Imagine airplanes or cars appliquéd to the center of each square for a little boy's room... Fun! 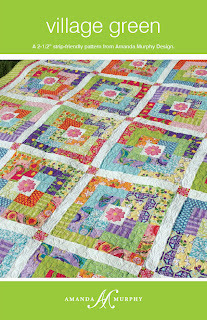 Blossoms is the third quilt in the line and is constructed from two 10"-squares/layer cakes. 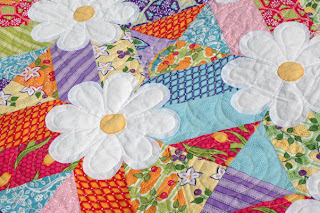 It combines simple piecing and fusible appliqué in a dynamic way is REALLY fun to construct. I love Blossoms in Veranda, but also want to make it up in Christmas prints, with big white blossoms with red centers. (If someone out there makes one of these please send me a picture!) As a fabric-lover I am very proud of Town Square. I designed it backwards, starting with a stack fat quarter of fabric and cutting them up 3-4 at a time. 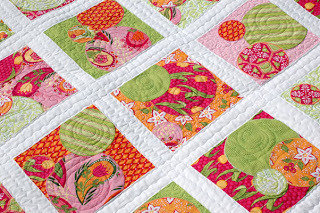 It uses up a stack of 20 or 12 fat quarters with VIRTUALLY NO WASTE. My friend Pat did a purple and aqua smaller version in the Garden color story of Veranda. Basically, it is a nine-patch within a nine-patch within a nine-patch, which makes it a great teaching quilt. I love the color wash effect that happened with the light green sashing. This pattern really lends itself to modern prints. 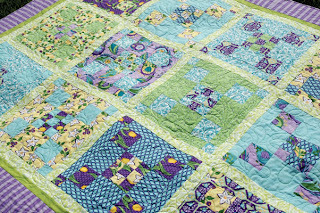 Bubbles is a whimsical design that is quick and easy to put together. 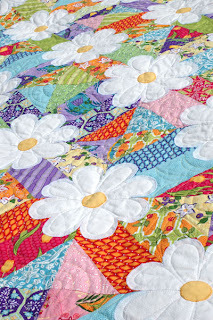 This was the very first quilt that I conceived in the Veranda line, and I love the lighthearted look that resulted. 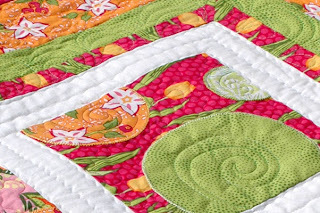 Contrasting, thick appliqué thread really makes those circles pop. A lot of people commented that they would like to experiment with attaching the circles with some of the specialty stitches on their machine. What a great idea! 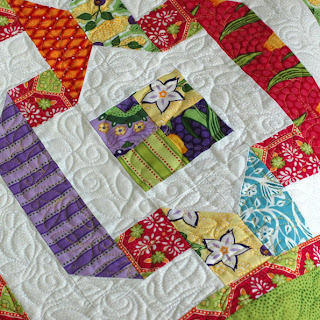 I love the little rickrack quilting in the sashing and the swirls in the blocks that echo the circles without copying them. Thanks, Deborah! Finally, Portraits of My Garden was my attempt to create a vehicle for those feature prints that we all love. 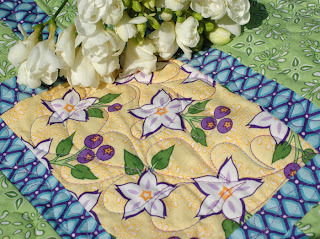 It is also the simplest quilt to sew - great for a beginner. 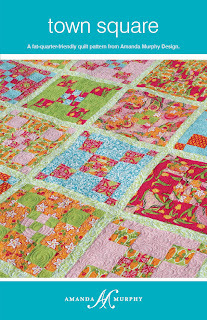 Strip piecing makes this quilt really easy to put together. Deborah Norris quilted this top as well. Speaking of which, don't you love it when you send something off to a quilter and he/she brings it to a whole new level? That is how I think about Deborah's work. This is also how I feel about putting patterns and/or fabric into the hands of all you creative people out there, so, if you make something with either my patterns (whether it is in one of my collections or not) or fabric, post a please picture to my flickr group. One of the things that I love about Fat Quarter Shop is their many Giveaways. Today is not an exception. Kimberly is giving away two full sets of my patterns to people who leave a comment on this post telling us your favorite new pattern of mine. 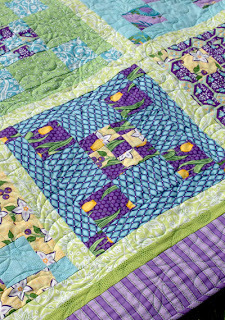 For a third chance to enter, hop on over to my blog and tell me what your favorite pattern in the line is. Contest closes exactly one week from post date. Thanks to Fat Quarter Shop for having me and to you all for listening.